Proper guidelines for high-risk women and better technology may increase breast screening and save lives. Screening mammography saves lives. Since 1989, with the inception of recommendations for yearly mammography screening beginning at 40, breast cancer mortality has decreased by 36% in the United States, according to the American Cancer Society. To more effectively direct screening efforts, women are stratified into three subgroups that delineate their lifetime risk for developing breast cancer: average, intermediate, and high. "Women at high risk are defined as those with greater than a 20% lifetime risk of developing the disease," says Jason McKellop, MD, medical director of Breastlink Tarzana in California. "The groups of women most associated with this classification are those who have a genetic predisposition for developing breast cancer—such as genetic mutations to a breast cancer gene, eg, BRCA1, BRCA2, TP53—who may carry up to an 85% lifetime risk, as well as women with strong family histories of the disease." Family history indicators include those with a first-degree relative with premenopausal breast cancer, multiple relatives with the diagnosis, a first-degree relative with a genetic mutation, or a male family member with breast cancer. Debra Monticciolo, MD, FACR, immediate past chair of the ACR Breast Imaging Commission, served as lead author on a 2018 paper that the ACR released with recommendations on screening for high-risk women. "Something that we found that was hiding in plain sight is that black women are at higher risk and are more likely to have genetic mutations and more likely to have BRCA1 and BRCA2 mutations, and that's been underappreciated," she says. "There are also genetic syndromes that have a higher risk of breast cancers as well as other cancers." Monticciolo notes that all women, especially black women and those of Ashkenazi Jewish descent, should be evaluated for breast cancer risk no later than age 30, so that those at higher risk can be identified and benefit from supplemental screening. "The problem is there are a lot of people at high risk who just don't appreciate that risk," she says. "Obviously, if your mother had breast cancer at a young age, it's going to be flagged. But if you just sit down and have a normal risk assessment, people will often find factors that come together, and we're discovering new genetic information all the time." Stamatia Destounis, MD, FACR, FSBI, FAIUM, a clinical professor at the University of Rochester Imaging Sciences and part of Elizabeth Wende Breast Care in Rochester, New York, says that, while multiple risk assessment models are in use, the Tyrer-Cuzick model is the most commonly used. "This specific model incorporates familial history of specific cancers in first- and second-degree relatives, any genetic predispositions known in the woman or her family, and personal risk factors such as hormone therapy use, age at menarche, and personal history of breast cancer or atypia," she says. Destounis, who also serves on Radiology Today's Editorial Advisory Board, notes that in addition to women of Ashkenazi Jewish descent and black women, those classified as high risk include women with a personal history of breast/ovarian cancer and previous atypical biopsy results such as atypical ductal hyperplasia or lobular neoplasia. High-risk women have different screening needs than average-risk women. While women of average risk for developing breast cancer should have annual screening mammography beginning at age 40, according to ACR guidelines, those at high risk should begin annual screening mammography either at age 40 or 10 years prior to the earliest known first-degree relative, whichever happens earliest. Destounis says a woman with an affected relative should commence annual mammography 10 years prior to the age of diagnosis in the relative, but not before age 30. "If a woman has received prior radiation therapy, annual mammography should commence eight years after the radiation therapy has ended but not before the age of 25," she says. "In addition to yearly mammography, this population of women is recommended to undergo annual MRI as a supplemental screening tool to mammography." Anjali Malik, MD, breast imaging radiologist at Washington Radiology in Washington, D.C., says high-risk screening is typically reserved for women who have a greater than 20% chance of the development of breast cancer over the course of their lifetime. "The most sensitive test for breast cancer screening is the MRI. However, due to the possibility of false positives from other benign breast conditions, it is best reserved for women at high risk or with extremely dense breast tissue," Malik says. "It should be performed at a certain time of the menstrual cycle to optimize the images. Contrast-enhanced [digital] mammography (CEDM) can also be performed as a screening study, and many centers are considering performing a single 3D contrast-enhanced mammogram as part of a high-risk screening protocol." All higher-risk women aged 30 and older should start with mammography. Monticciolo notes that the only women whom the ACR recommends having mammograms at an age younger than 30 are those whose chests were exposed to radiation treatment at a young age, such as teenagers who have had Hodgkin's lymphoma. "The imaging modality most useful in the higher-risk population is breast MRI, which is the most sensitive imaging method for breast cancer detection and has been shown to help find tumors early, especially in populations that have a high preference of disease," she says. For those patients who cannot tolerate an MRI, supplemental screening ultrasound is recommended, though ultrasound combined with mammography is not as sensitive as MRI combined with mammography. This is why, whenever possible, MRI is the preferred supplemental test. McKellop notes that patients with a genetic predisposition may begin mammographic screening at age 30 and MRI screening at age 25. "As a supplemental screening utility in these patients, contrast-enhanced breast MRI is recommended, as it improves the sensitivity for detecting breast cancer," he says. "Improving this process in recent years are higher-field magnets offering higher-resolution images as well as imaging protocols that shorten the duration of the exam." High-risk screening differs from standard breast cancer screening in a few fundamental ways: First, MRI adds an imaging modality—in conjunction with mammography—to high-risk screening. MRI requires an intravenous injection of gadolinium contrast, however, to highlight the trouble spots at the time of the study. In addition, MRI involves no radiation exposure, whereas mammography utilizes X-ray technology, which is associated with a small amount of radiation to the patient. MRI is also a more time- and resource-consuming modality than mammography. Rakesh Parbhu, MD, radiologist at Envision Physician Services and cochief of women's imaging at the Memorial Healthcare System in Hollywood, Florida, says specific-to-mammogram 3D imaging is the preferred method for most, though there's still a lot of traditional 2D being done in certain parts of the country. "Women who are at high risk with dense breasts should get supplemental imaging with ultrasound," Parbhu says. "MRI is something we try to tailor about six months after the mammogram, so we're screening twice a year and, if something came up, we would catch it early." Access to technology is a challenge for many women—especially for younger women just starting families. Many communities don't offer breast MRI. And some women find MRI difficult to tolerate. "In high-risk patients, supplemental screening with MRI can be time consuming with examination times lasting up to 40 minutes," McKellop says. "Women who are claustrophobic may not tolerate the examination due to the confines of the MRI tube. In addition, MRI being a more sensitive examination may lead to more biopsies, many of which yield benign results." Some of the most salient challenges to breast cancer screening currently include the conflicting recommendations that exist for appropriate screening in the average-risk population, which may leave some patients confused as to when to begin screening and at what interval to continue screening. Prior to 2009, there was a consensus among medical organizations that the screening recommendation for all average-risk women should be yearly mammography beginning at age 40. In 2009, the United States Preventive Services Task Force (USPSTF) came out with a statement that women should begin mammography screening at 50 and continue every other year thereafter. This caused great debate among other organizations and authorities in the radiology community. "This recommendation by the USPSTF has allowed health insurance companies to decrease coverage to average-risk women due to the decreased screening schedule," Destounis says. "This screening schedule is harmful to women. It has been proven that yearly mammography beginning at age 40 saves the most lives." Due to the conflicting recommendations, however, some patients and their referring physicians are no longer comfortable with deciding which screening schedule women should follow. The burden of paying for screening is also being pushed more onto the patient as a result of these recommendations. "In some states, if a woman were to follow a yearly screening schedule, she would have to pay out of pocket for the exams every other year," Destounis says. "If a woman with dense breasts were to undergo a supplemental screening ultrasound, the ultrasound may not be recognized as part of her screening testing, and she would have to pay for the additional screening." The latest technology within mammography is digital breast tomosynthesis (DBT), a type of mammography that takes multiple images of each breast as the X-ray tube moves a preset number of degrees at a time, which helps radiologists to "see through" dense glandular tissue. This helps to decrease the masking effect that dense breast tissue can have, which can hide potentially harmful lesions. DBT has been shown to increase cancer detection and reduce the callback rate of benign, or false-positive, findings. Another recent technology that has helped is CEDM, which Memorial Sloan Kettering Cancer Center and some other health centers are starting to utilize more. Monticciolo explains that CEDM, in terms of the information that can be obtained by the exam, is similar in concept to contrast-enhanced breast MRI. In many cases, however, women may better tolerate CEDM, as it is a shorter, faster exam, performed in the same way as a standard mammogram. There are exciting technological advances being made in existing imaging modalities as well as burgeoning new ways to image the breast, many of which show improved cancer detection rates compared with existing methods. "On the immediate horizon are abbreviated-protocol breast MRIs, which significantly shorten the duration of breast MRI studies—from 30 to 45 minutes down to 10 to 15 minutes—and boast similar sensitivity and specificity for detecting disease," McKellop says. "[In addition,] multiparametric breast MRI offers improved specificity as well as promising new information about the underlying oncogenic processes of cancer development and progression." 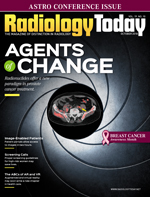 Finally, McKellop says, supplemental screening modalities such as FDG-positron emission mammography and molecular breast imaging have shown improved cancer detection rates, compared with existing methods, but lack evidence from large screening populations and are associated with increased radiation exposure.